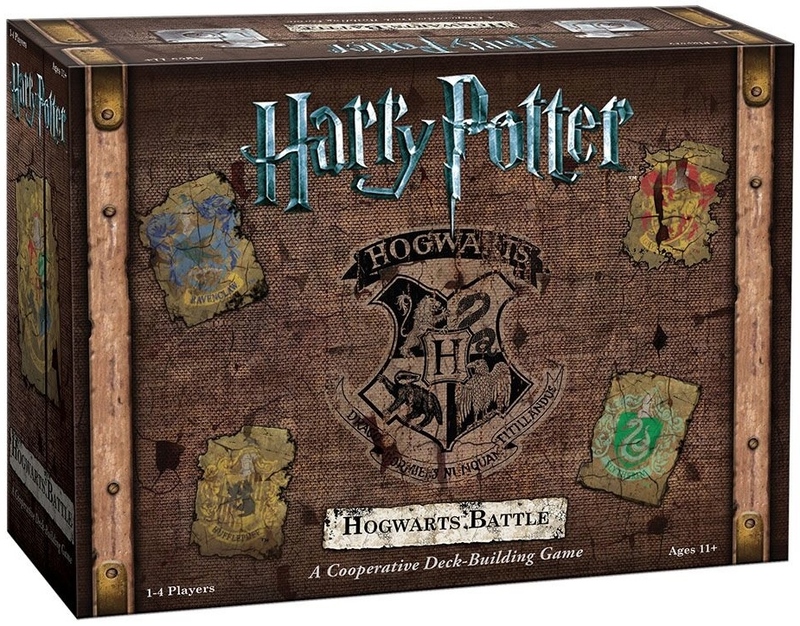 Harry Potter: Hogwarts Battle is a game by Andrew Wolf, published by USAopoly. It is for 2-4 players. In this game, players will take on the role of Harry Potter and his friends as they work together to stop Lord Voldemort from gathering his evil forces to take over Hogwarts. Players will have to defeat powerful villains and secure different locations as they battle against Voldemort’s minions. They’ll also have to learn new spells and gain powerful magic items if they hope to stand a chance. If they’re able to defeat the villains before they can take control of the varied locations, they’ll be declared the winners. Otherwise, He who shall not be named will control the entire world, ridding it of those pesky Muggles. Before we begin, let me note that this review will be as spoiler free as possible while still explaining the rules and describing the contents of the game to the best of my ability. Basically I will only be covering the setup and instructions for Year 1. I will give what information that I can about the later years in the components, rulebook and gameplay sections below. To begin, the board is placed in the middle of the play area. Each player is then given a player board which is placed in front of them. They also receive a health tracker, which is placed on the 10 space of their player board. The villain control tokens, attack tokens and influence tokens are all place in separate piles near the board. The Game 1 box should be opened and the contents sorted by type. The Location cards are placed face up in order on the appropriate space on the board. The Dark Arts cards are shuffled and placed on their space on the board face down. The Villain cards are also shuffled and placed on their space face down. The top card is revealed and placed face up in the first active villain space. The starting hero decks are removed and sorted by name from the stack of Hogwarts cards. The Hogwarts cards are then shuffled and stacked face down on the appropriate space on the board. The top 6 cards are drawn and placed on the spaces below the deck. Each player now chooses a Hero and takes the turn order and Hero card for that character and places them face up above their player board. Each player also receives the matching Hero’s player deck which is then shuffled and placed face down on the left side of their player board. Players now draw the top 5 cards of their deck. The first player is chosen and play now begins. During the game, players will take turns, each following a series of 4 steps. Those 4 steps are reveal and resolve Dark Arts events, resolve Villain abilities, play Hogwarts cards and take Hero actions and end your turn. The first step is to reveal and resolve Dark Arts events. To do this the active player will look at the current Location. This will determine how many events need to be revealed. One at a time, the player will reveal and resolve the Dark Arts event cards, following the card’s instructions until the number required has been met. Each card revealed is then placed in the discard pile. The next step is to resolve Villain abilities. To do this the active player will check the Villain card and if events or other villains cause the card to be triggered, then the instructions are followed and the villain’s ability is resolved. The third step is to play Hogwarts cards and take Hero actions. In this step the player is allowed to perform several different actions in any order that they choose. The player can play cards to gain resources and generate effects. Any tokens gained should be placed on the player board. The player can gain either attack tokens or influence tokens. Attack tokens may be assigned to a villain. If the number of tokens equals the health of the villain, then the villain is defeated. The player then gains the reward listed on the bottom of the villain card. The card is then placed in the discard pile and the attack tokens are returned to the supply. 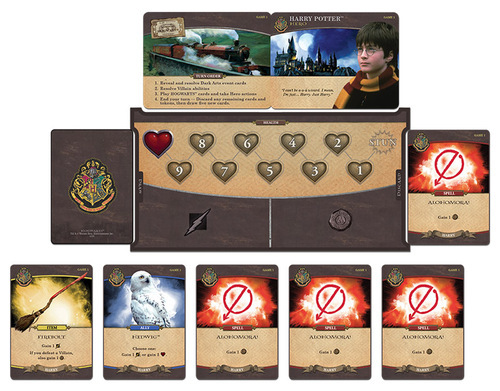 Influence tokens allow the player to purchase any of the 6 Hogwarts cards that they have the tokens for. Newly acquired cards are placed in the player’s discard pile unless otherwise noted. The final step is to end your turn. Once the player has finished playing cards, taking actions and using tokens, they will then follow 6 steps in order. First they will check to see if the villains have enough villain control tokens to control the current location. If so, then the control tokens are removed and the location is discarded. The player then reveals the next location card. Next the player checks to see if there have been enough attack tokens placed on the villain to defeat them. If so the attack tokens are returned to the supply and a new villain is drawn to replace it with. Next any empty Hogwarts card spaces are refilled from the deck. The player then places all the cards that they played during their turn into their discard pile. Cards can not be saved for the player’s next turn. The player then discards any unused attack and influence tokens. The player then draws a new hand of 5 cards, shuffling their discard pile if they don’t have enough cards in their deck to draw. Play then passes to the next player. The game continues with players taking turns until the game ends. The game can end in one of 2 ways. If the players defeat all the villains in the Villain deck, then the game ends and the players are victorious. The game can also end if the villains manage to control all of the locations from the Location deck. If this happens, the players lose. It should be noted that sometimes a player will lose all of their characters health points. If this happens the character is stunned. They can not lose or gain any more health during the turn they were stunned. They must then discard any influence and attack tokens they have saved on their player board. They will also have to discard half the cards in their hand rounded down. A Villain Control token is then added to the current location. If the active player was the one that was stunned, they may now play cards and take actions with whatever they have remaining. Once the active hero’s turn is finished, the player resets their Hero’s health to 10. This is an absolutely amazing looking game. There are individual player boards that keep track of your health with the help of some really great health tracker tokens shaped like a heart. The boards have spaces on them for your attack and influence tokens as well. Everything is labeled so you know exactly where to put your cards around the player board. The attack and influence tokens are great. Attack tokens are lightning bolts and the influence tokens are seals. These aren’t the only cardboard tokens and pieces that you’ll find in the game, however those pieces don’t come out until later years. They’re pretty awesome looking though, just trust me. The board is really well designed with spaces for all the cards to be placed. I really like the faded spaces on the board so that it doesn’t overwhelm you yet still provides a great guide for getting organized fairly easily. Another note about the board, when you first open up the box the board is laying on top of the other components and the section on top looks like you’ve just opened Harry Potter’s wizarding chest. The artwork on that side of the board is really cool looking and gives you a great sense of the game, even before you start playing. Thematically it’s awesome. The game also comes with the villain control tokens. These are small metal tokens with skulls on them. They are SO awesome. I love the detail that was put into these. VERY cool. With this being a deck building game, of course there are gonna be a ton of cards. With everything from locations, villains and dark arts cards to Hogwarts, hero decks, heroes and turn order cards, every one is beautiful. I LOVE the cards in this one. There’s a lot of photo quality images as well as different spell designs. You will be blown away at the overall look of the cards. Of course there are some more card designs that will come into the game in later years but we’ll just say that these are similarly great looking. There are also some other pieces that add to the gameplay, but I’m not going to go into that here. I’ll just say that every piece including the ones that I haven’t mentioned all look great. The way that you get these new pieces is from the different year boxes. Each game’s components are contained in these handy little tuck boxes with everything you need to play the game for that year. Later as you’ve played through the game, there are sorting cards to keep things separate so that you don’t have to put things back into the year boxes. Another really great thematic approach to the game that I think is brilliant. The quality of the game is outstanding. If you’re a Harry Potter fan, you’ll love the look and design of everything in this game. It’s fantastic. The rulebook for this game is really unique. The book is designed to be used as you play the game for the first time. It walks you through setting up the game, explaining the different cards and components that you’ll be using along the way. Each page has some great pictures and examples. Everything looks amazing. The last couple of pages end the rulebook with some additional rules about defeating villains, location control and the hero’s health. The back cover is a little thicker than the rest of the book as it has slots in it for smaller rule books to be placed inside them. That’s right, each year of the 7 years has special rules for them. The rules for these are some small folded up sheets that say which game year they came from. These are then stored in the slots. You’ll only get these when you open the next box of components for the next game. That means that you’ll open Year 2 and get Game 2 rules for the game at that time. Each one of these has some great pictures, examples and are wonderfully designed. I love the way this was done, so that you don’t read something or get information about it until you get to that game year. What a truly cool and unique design and I love it. This is really great and I love the way this was done. A really great idea that was designed perfectly. It’s no secret that I love deck builders. I’m also a huge fan of the Harry Potter books, movies and games. My whole family loves the Lego video games. Needless to say, this game fulfills every wish for me in one box. Let me spoil the rating and go ahead and say, I LOVE this game. The game seamlessly walks you from a deck building newbie to a full fledged veteran in a few simple games. I like how the game continues to amp up the pressure and the difficulty the higher into the years you go. I like that the initial game doesn’t throw too many things at you so that you can really grasp the concepts and mechanics. For us veterans the rulebook says that you can jump ahead a couple of years and go right for the gusto. I personally enjoy working my way up and enjoying the journey through the game and movies. I really like how that each year adds just a bit more to make things interesting without completely bombarding you with new content. The game is fairly simple to begin but that difficulty level really starts getting tougher each year. You really have to work together and plan a little bit to get through those later years. This game works great with the kids as well as the adults. My wife even got interested in the game and she doesn’t get very excited about most games. I like that you still have the normal mechanics of a deck builder but instead of trying to get the most points for your own deck, you have to think about which player would be better off at buying which items and performing which actions. It’s the co-op portion of this game that really sets it apart from all the other deck builders out there. Fans of Harry Potter should really enjoy this one. Deck builder fans will enjoy this one as well. However if you like both, you’ll LOVE this one. It combines both into a truly awesome game that you’ll want to come back to again and again. I highly recommend this game. It’s an absolute joy to play. 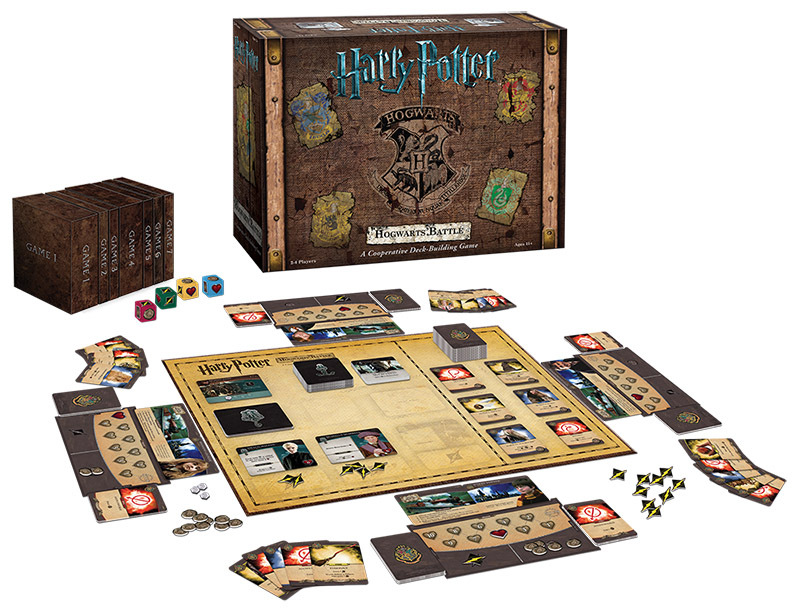 Harry Potter: Hogwarts Battle is a cooperative deck building game set in the Harry Potter world of Hogwarts. The game time varies from about a half an hour to around an hour. Earlier years don’t take as long and the later years will. The artwork and theme are fully integrated. The art is mostly photos of different characters and items but also has some unique looking artwork as well. Every piece in the game is of the highest quality is looks absolutely wonderful. The game is a ton of fun and is easy to teach thanks to the wonderful rules that walk you through how to play. I love both the co-op and deck building aspects of the game. As a deck building and Harry Potter fan this really scratches an itch that I didn’t even realize I had. Fans of the Harry Potter universe, like my wife and kids, will really enjoy the game. Deck building fans will enjoy the mechanics and co-op gameplay. Those fans of both, will LOVE this game. This is a game that I highly recommend. It’s so much fun, even though it can get pretty dang difficult especially in the later years. This is one that’s great for new and old players alike. I can’t recommend this one enough. You will thoroughly enjoy this one. It’s more fun than a barrel of Muggles. For more information about this and other great games, please check out USAopoly at their site. This entry was posted in Reviews and tagged andrew, andrew wolf, battle, board, board games, card, card games, games, harry, harry potter, hogwarts, hogwarts battle, potter, usaopoly, wolf. Bookmark the permalink.